Come relax with fellow Canadian Alumni and Canadians in Colorado. 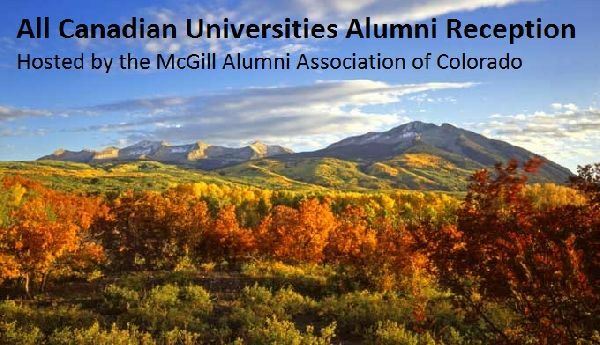 Mark your calendars for another energizing "Colorado - All Canadian Universities Alumni Reception" hosted by the McGill Alumni Association of Colorado. This invitation is open to alumni (and their guests) who attended a Canadian University (College or CEGEP), parents of students at Canadian Universities and friends of the local Canadian community. Members of Canada's Foreign Service and military stationed in Colorado are always welcome to these events as well! This reception promises to be a great social gathering where we can meet and re-connect to share memories of our time spent in Canada, talk about what we're doing in Colorado and have one more toast to Canada's 150th Confederation Anniversary. As always the evening will conclude with a traditional Canadian Trivia contest with prizes! Appetizers will be served and a cash bar will be available.